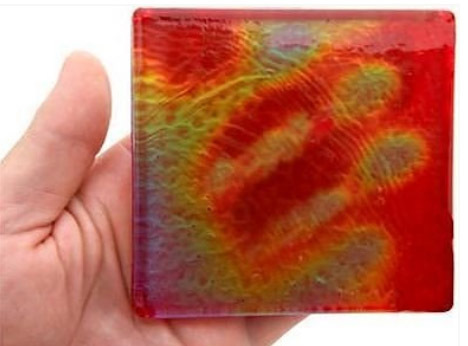 Moving Color, the creators of these incredible temperature-sensitive, color changing glass tiles, have a very good point to make: traditional tiles don’t do anything. Call us over-stimulated, but we actually kind of enjoy being in a dynamic environment with fun, interactive things all around. And these tiles definitely fit that description. They change colors depending on the ambient temperature, kind of like those Hypercolor clothes you were so crazy about in the early 90s, but slightly more awesome. 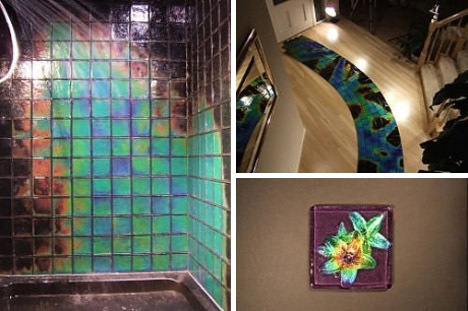 They can be used in all sorts of residential and commercial applications, from kitchen countertops to showers to wall art to creative floor displays. But even more exciting is the fact that they’re somewhat eco-friendly, using 20%-80% recycled glass. The color-changing tiles have already been used in the ridiculously well-appointed Mickey Mouse Penthouse in the Disneyland Hotel. When you turn on the shower and the hot water warms the tiles, images of Mickey appear all around you in the temperature-sensitive tiles. But the company that produces the tiles isn’t interested in pigeonholing their creation: they want to see it used in appliances, surf boards, casino chips, pots and pans, children’s books and car hardware, among about a thousand other ideas. Basically, any surface or item that undergoes a significant temperature change while in use is a candidate. The possible applications for a material like this are basically limitless, so it will be exciting to see them pop up all over the place in the coming years.